Today was my oldest son's first day of winter break. My two boys spent the day fighting over who could play with which action figure, while watching the same episode of their favorite cartoon for the 50th time. They have watched the show so many times that my oldest can recite the words, honestly, I probably could too. I made pancakes for lunch since the weather has turned nasty today. I love snow, just not the biting cold wind that has gone along with it for the entire day. It just felt like a breakfast for lunch kind of afternoon. This seems to be a pattern that I have been in for the last couple of weeks. Whenever I am stressed or I am not feeling up to par, I bake/make breakfast foods. There is something very home-like and comforting about baking a coffee cake or pancakes. It instantly makes you feel better about whatever is bothering you. 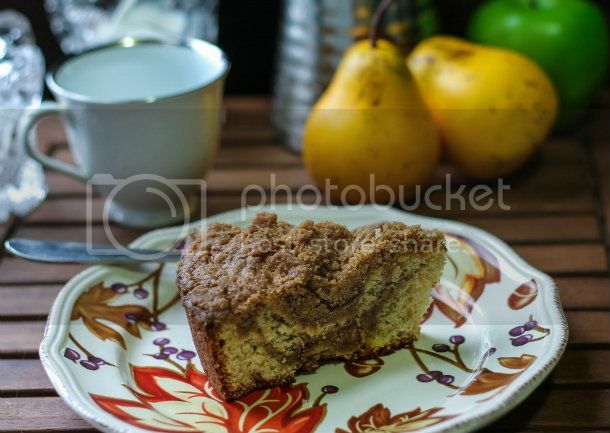 This week I made a new recipe for Cinnamon Streusel Coffee Cake from the January 2013 issue of Family Circle magazine, which looked perfect for a cold winter morning. This recipe has 14 ingredients. It takes 65 minutes of baking, 20 minutes of prep and makes 16 servings. I made a number of changes to this recipe. First, I made it gluten free since I can't eat gluten. For the flour I used a brand of gluten free all-purpose flour which uses coconut flour as the base, it works great in baking. Instead of a 9 inch pan I used a cake pan to bake the coffee cake. I prefer the shape of coffee cake done in a cake pan, I think it looks prettier on the plate. In order to ensure that the coffee cake didn't stick I cut a piece of parchment paper and then sprayed it with cooking spray. This method is a no fail and I use it with any type of cake or torte. Finally, I found that I had to tent my cake with foil to prevent over browning and added an additional 5 minutes to the baking time. I followed the remainder of the recipe as written. My two boys devoured this coffee cake. It was very light and airy and was perfect with a cup of coffee in the afternoon. Since I used gluten free flour it was a little rich, I think in the future I would cut down on the butter to compensate. The streusel topping was the best part of this recipe and made for a delicious crunchy crust. omg that looks so good im going to try that. It really is yummy and very easy to prep! I LOVE coffee cake!! THat looks so amazing!!! Me too :) Thanks for the sweet comment! I can't wait to try this recipe out! I'm linking up from the Harvest of Friends Blog Hop. I would love for you to follow me back! This looks absolutely wonderful! The crunchy topping - omg- it looks so yummy! Will have to try something like this soon! BTW, I found you via the Aloha Blog Hop - pleased to meet and follow you! If you're interested in writing and photography, I'm over at pictimilitude.com :) Have a great weekend and a great holiday! I was scrolling through my Google Reader and came to your post and OMG my mouth began to water. I'm starving now and craving this delicious looking coffee cake. I'm leaving for vacation tomorrow but I really want to make this when I get back. Although it would be nice if a Streusel Fairy came by and left it for me to have in the morning. I love how you adapt all of the recipes you post and make them gluten free. A few of my family members are gluten free and it's nice finding recipes that you've had success converting. Baking gluten free can be a lot of trial and error. I have had more than my fair share of misses :) Thanks for the sweet comments, I hope you have a great vacation! Ok - now that looks delicious!That crunchy top looks so good! Happy Holidays!